Mage Knight needs no introduction as it has topped many 'best of' lists since its release in 2011. It has consistently been voted the best solo game of all time and it is a game that was on my grail list of games to learn and play. 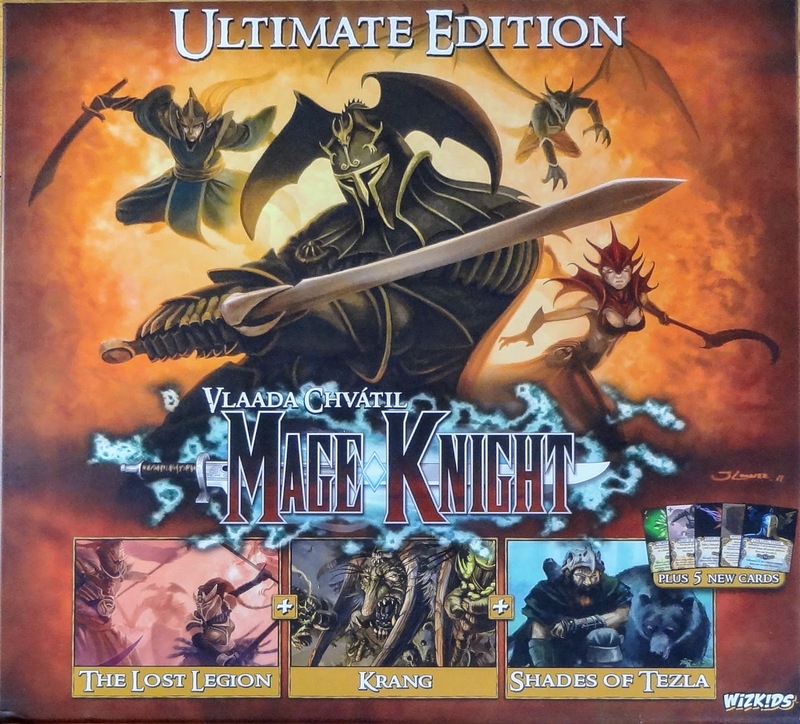 This is Mage Knight Ultimate Edition which includes all of the expansions and additionally 5 extra cards on top of what has already been released. If you're not familiar, players take on the role of a titular 'Mage Knight' as they explore a fantasy realm, fighting monsters, looting artefacts, pillaging monasteries and besieging cities. The 'realm' is an unknown quantity before you start exploring and your knight will encounter a plethora of fantasy tropes during their quest. There are a total of 18 different scenarios in the Ultimate Edition, 11 from the base game and the remainder from the expansions. The goal of each game is to achieve the scenario specific objectives before time runs out. 'Time' is tracked by a day/night cycle of no more than 3 rounds which initially feels very restrictive. Each scenario can be played competitively, cooperatively or solo, some would argue it's best at one player (I think I'm in that camp too). Your character will level up, gain abilities as they defeat monsters and interact with villagers and mages throughout the land which hopefully has prepared you enough to take on a city. Once you're familiar with the rules, the game can be reduced to a brain-burning exploration puzzle with generous helpings of high-fantasy. It has a reputation for being a very heavy and complex game but I think this is unfair. I read the majority of the 'Learn to Play' booklet and then watched Ricky Royals excellent playthrough videos which completely prepared me to tackle the introductory scenario, First Reconnaissance. The core system of the game is not hard to learn, the complexity comes from a lot of specific rules for each type of monster, site, or terrain tiles, which will also change from day to night. However these specific rules breath thematic life into this optimisation puzzle of a game. Each day or night round will start by rolling a pool of mana dice and drawing an initiative card to determine which player goes first. There will probably be some bonus as well described on the card to make the choice of initiative card a little harder instead of 'I want to go first I'll pick number 1', number 6 (the highest initiative card has the greatest bonus. The role of mana dice locks those dice to one of 6 different colours of mana, which can be used once per turn by any knight to power their Deed Cards. After a mana dice is used like this it gets re-rolled back into the pool. Despite the rolls being random, the mana dice really requires a level of skill to use optimally, the best play will nearly always involve at least one mana dice, but finding the best use of mana can be tricky. The game, or your knight's actions throughout the land, is primarily driven by the Deed Cards that you play. Each card has two effects and when played, affords your knight a certain number of points in either move, influence or combat attributes. These points are then available for your character to spend by performing the associated movement and/or action once per turn. All cards can be imbued with mana which allows for the more powerful effect of the card to be played. Any cards played are discarded at the end of your turn and you will draw up a new hand so that you can start planning your next go whilst your opponent is taking their turn. I can understand why people say this game is the best solo; with multiple players, there is often a lot of downtime, or conversely too much pressure to move when you're searching (often in vain) for better actions. As you generate points from the cards you can explore new terrain tiles. Each hexagonal-shaped tile has a variety of terrain types on it from countryside to mountain and forests to deserts, both of which have different movement costs during the day and night time. It's little tweaks like this, littered throughout the game, that makes this game notoriously complex. However, I didn't find one 'tweak' that didn't logically fit or feel thematically correct. For example, moving through a forest is much harder at night and moving through a desert during the night is much easier. I don't have personal experience of the latter but I've read enough books to have been told that many times. As you reveal a new tile you will place tokens corresponding to any icons in terrains spaces. At the end of your move, you may be able to interact with whatever token is in the terrain space you've stopped at. Again each site has their own specific rules however you'll primarily be attempting to generate enough influence points to hire some units to aid you in your quest. Of course, there are many other options available to you which all depend on what type of token you've stopped at. You can plunder, attack, recruit, buy spells, train etc. etc. The list is fairly comprehensive and because of the number of different options you have, not just in token interaction, but route choices, ability options when you level up and combat actions, the optimal path can be hard to find. Often, the tokens you place onto the board will be monsters, or interacting at sites will cause monsters to spawn. The base game has a large array of different monsters from several different monster types. the most common are the orcs on green tokens. However, The three included expansions add an almost bewildering amount of stuff for the new player. If you are a new player coming into the game with this version as your starting point, for the sake of your own sanity, please only play with the base game for your first foray or two. Tokens can cause multiple enemies to spawn or a conjurer who will summon even more monsters to attack in their stead. It's never a nice feeling to face three enemy spawns when you were hoping for an artefact from a dungeon. The combat system of this game is ingenious. It took me several games to get my head around it, especially as with your first game or two you're not going to see the more advanced enemies with a variety of combat-effecting attributes. Each time your turn ends on a space with a monster you will fight. If you don't defeat them straight away, i.e after one round of combat, you will take wounds into your hand and withdraw. It is a rather binary affair, you've got one chance to generate enough block and attack points to defeat them else you lose the combat. The points are generated in exactly the same way as movement or influence points are, but it is the careful use of mana tokens, crystals and mana dice (yes there are three sources of mana to juggle) which will allow you to be successful. Each fight will start with a Ranged Attack in which you will get a chance to attack the enemy. These attack points aren't that common on your starting cards and without additional units to play this is not likely to succeed. Next, the enemy attacks the knight, which can be blocked using generated block points. If the enemies' attack is not blocked your knight will take wound cards depending on the strength of the attack and their armour. After you've blocked the enemies attack, it is finally your chance to kill the enemy. If you can generate enough attack points to defeat their armour, congratulate yourself. You've just gained some fame and maybe some influence with the local population. There are, of course, a multitude of different attributes that can affect the simplistic combat described above but generally they all work on the concept of doubling or halving the required attack or block points. The rules call this 'efficiency' if your block is efficient against the type of enemy attack, e.g. a cold block is efficient against a fire attack, (makes sense right?) your block points are applied fully. If your block is inefficient you will need to generate double the number of block points to have the same effect. Again there are a lot of different combat attributes that use a similar mechanism, e.g. swift attacks need twice the amount of block to be defended against, which to my mind is efficiency re-skinned. If you can get your head around efficiency any combat will be a doddle, to resolve if not to be successful! As you defeat enemies and level up, more powerful abilities and spells will be available to you. If you're really good/lucky you'll maybe get a powerful artefact. However, during the course of any one game, you'll only see a small, if not tiny, selection of all the possible cards that you could have. There is a tremendous amount of replayability. It is this replayability that reminded me of Magic Realm, in scope if not depth, however, this is still dwarfed by that much older game. No other game (that I've played) comes as close to the breadth and depth of Magic Realm as does this. Any game that evokes Magic Realm in any aspect is doing alright in my book. Let me get this off my chest, the box is massive, it's far too big and I'm almost considering ditching it. It takes up an inordinate amount of space on your shelves and there is no reason for it to be so big. there is a good 3 cm empty space at the top of the box. The insert is perfect if all you want to do is transport the game to a buyer undamaged; for anything else i.e. playing the game, it is terrible. It falls far short of being useful and I have already ditched it in favour of plastic bags and elastic bands. Wizkids have attempted to provide afunctional insert, there are card slots for individual decks and spaces for the dice etc. but the tokens are all in the same slots which is less than helpful considering the setup time of this game. A third-party insert is almost a must although none are on the market as of Jan 2019 - I am attempting to design my own. There is a dizzying amount of content when you throw the base game and all expansions in together. We are spoilt with games offering 50+ scenarios in the box (Gloomhaven et al) and I think the vast majority of scenarios go unplayed in those games; at least by me and my game groups. Mage Knight (the base game) has 11 scenarios but the re-playability is off the scale. The terrain will be different the encountered monsters will be different, as will be the spells, abilities and artifcats that you collect. I would rather have replayablility with a wide variety of content than lots of different scenarios using the same content. The miniatures come painted, and as someone who enjoys painting minis to quite a good standard, the quality is terrible. However, as someone with limited time to paint minis I am very grateful that they come pre-painted at-all and they're certainly good enough to get the job done, i.e. look good on the table. A factory paint-job will never match the quality or time that a hobbyist can put into their own miniatures so they get a thumbs-up from me. The one standout area of the games' artwork and design is in the cards. Each card has unique artwork that is evocative of the card's effect and beautifully drawn to a similar quality of a Collectible Card Game. The rest of the tokens and terrain are fairly generic but it gets the job done and, more importantly, clearly conveys all necessary information (once you're familiar with all of the icons). Insert doesn't help a long game set up and is actively keeping me from playing more. Long time between turns when playing multiplayer. This game wont be for everyone, but I couldn't do anything but recommend it to every gamer I know. It presents players with so many different and difficult decisions every single turn and the pressure to advance is constant; the first turn is as important as the last. It never feels unbalanced and I always have a niggling doubt that I could have played a hand better. There is no right way to play, but there certainly is a variety of good ways to play. I wonder if the best plays will still be elusive after 20 plays. I still dread going up against a city or even delving into a dungeon. But the challenge is always rewarding and this is one game where I come away thinking about the next time or things I could have done better. Ignore the ruins, the red City beckons, Fire Dragon needs dealing with first...great game. I prefer this game solo, or at most with 2 experienced players (I now include myself in that bracket...), playing cooperatively. I tried it with three and I've tried it competitively and it was not as much fun for me. I lost heavily when I was playing competitively but I'd like to think that doesn't sway my opinion (much), I just found the down time untenable and the disappointment of being outwitted by another player quite unpleasant. Which is strange, beacuse normally I don't care whether I win or lose a game I just like to play. I enjoy playing and regularly losing at chess, but that doesn't bother me at all. Chess is an abstract that doesn't tell me a story like Mage Knight does. I am invested with the story in Mage Knight. I want my knight to succeed and defeat all the things. A game that conveys a story without presenting you with a written narrative is doing something right in my book. Mage Knight has that quality in spades, the mechanics tell a story, a good story story at that, and that is what is going to keep me coming back to Mage Knight as often as I can; just as soon as I can make a different insert.